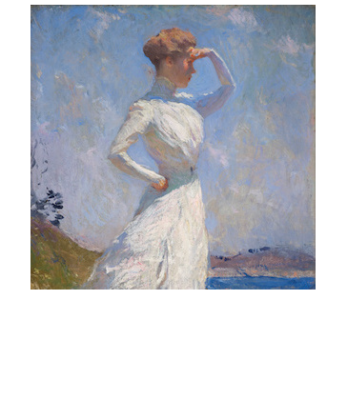 The most complete source of information on Frank W. Benson is the collection of his papers at the Peabody Essex Institute in his birthplace of Salem, Massachusetts. In the James Duncan Phillips Library the Frank W. Benson Papers contain correspondence, his artist’s scraphooks, awards, photograph albums, his portfolio, some student sketches, even the hood given to him by Tufts University when they gave him his honorary degree. Also at the Peabody Essex are the papers of Daniel Henderson a close friend of Benson’s who saved their correspondence from 1881 to 1924. The papers and travel journals of Ellen Perry Peirson, Benson’s wife are also at the Peabody Essex. Another rich source of original documents is the Archives of American Art, Smithsonian Institution, Washington, D.C. and New York, N.Y. There I was able to read on micro film the following papers : Frank W. Benson Papers, Guild of Boston Artists Papers, Willard L. Metcalf Papers, Philip Leslie Hale Papers, Scraphooks of: Edwin C. Shaw, Frank Vincent DuMond Papers, Childe Hassam Papers, J. Alden Weir Papers, Catalogues of Doll and Richards, Boston Art Club and J. Eastman Chase, Pennsylvania Academy of Fine Arts Scraphooks. Charlotte Barton West Papers, Joseph Lindon Smith Papers (unfilmed, stored in Washington), Carnegie Institute Papers (Washington office only), Milch Gallery Papers (unfilmed, stored in New York), Macbeth Gallery Papers, Museum of Fine Arts, Boston, Directors’ Correspondence. Akron Museum of Art, Ohio. Benson File. Albright-Knox Art Gallery, Buffalo, New York. Benson File. American Academy and National Institute of Arts and Letters. Secession Documents of 1897, Benson File. Art Institute of Chicago, Illinois. Benson File, Departmental Files, registrar’s Cards. Ball State University Art Gallery, Muncie, Indiana. Benson File. Birmingham Museum of Art, Alabama. Benson File. Boston Public Library, Fine Arts Department. Benson File. Boston Public Library, Print Department. Benson File, Charles H. Woodward File. Cincinnati Museum of Art, Ohio. Benson File. Cleveland Museum of Art, Ohio. Benson File. Corcoran Gallery of Art, Art Reference Library, Washington, D.C. Benson Files. Detroit Institute of Art, Michigan. Benson File. Fine Arts Museums of San Francisco, California Palace of the Legion of Honor. Benson File. Frick Art Reference Library, New York City. Benson Photo File; Theodore Robinson, Unpublished Diaries. The Huntington Art Collections, San Marino, California. Benson File. Lynn Historical Society, Incorporated, Lynn, Massachusetts. Benson File. Massachusetts Art Commission, Boston. Benson File. Memorial Art Gallery of the University of Rochester, New York. Benson File. Museum of Art, Rhode Island School of Design, Providence. Benson File. Museum of Fine Arts, Boston. Benson File, Benson Microfilms, Director’s Correspondence. National Academy of American Art, Washington, D.C. Benson, Lindon Smith and Tarbell Files. National Archives, Washington, D.C. Benson entries regarding Library of Congress Murals. New Britain Museum of American Art, New Britain, Connecticut. Benson File. New England Society for the Preservation of Antiquities, Boston. Benson Photo File. New York Public Library, New York City. Frank W. Benson Scrapbook. Pennsylvania Academy of the Fine Arts, Philadelphia. Archives, Correspondence Files 1891-1939. Pennsylvania Academy of the Fine Arts, Philadelphia, Art Reference Library. Benson File. Portland Museum of Art, Maine. Benson File, Historical Archives. Portland School of Art, Maine. Archives. Saint Louis Museum of Art, Missouri. Benson File, General Archives. Sheldon Memorial Art Gallery, University of Nebraska, Lincoln. Benson File. Toledo Museum of Art, Ohio. Benson File. United States Passport Office, Washington, D.C. George F. and Frank W. Benson Passport Documents. University Art Museum. University of Minnesota, Minneapolis. Benson File. Valley National Bank, Phoenix, Arizona. Benson file. The following museums, libraries and historical sites have one or more Bensons in their collections. 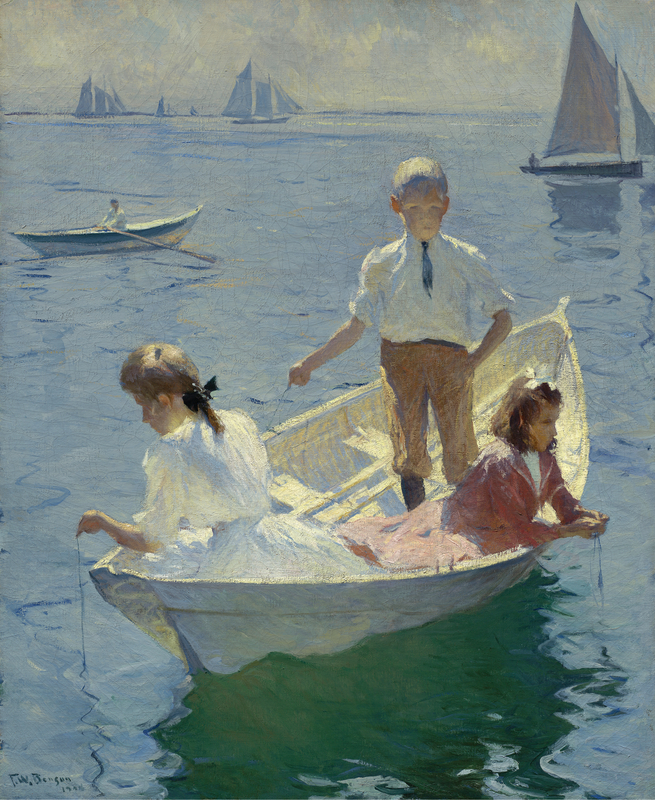 Since a number of these institutions may not have their Bensons on permanent display, it is recommended that you call ahead to see if the painting in which you are interested is currently being exhibited. 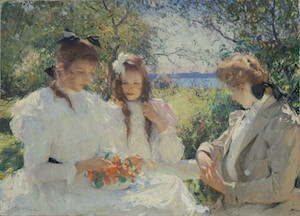 With advanced notice, it is often possible to arrange to view a painting that is in a museum’s stacks or storage area. Corcoran Art Museum, Washington, D.C.
Library of Congress, The Great Hall, Washington, D.C.